"This vibrant, tragic and surprsingly funny book is the best account yet of ordinary life—for blacks and whites—under Mugabe’s dictatorship." "A nuanced, funny, and heartbreaking story." "Do we really need another memoir by a white Zimbabwean? The surprising answer is yes, if it's as good as Douglas Rogers' THE LAST RESORT….A ripping yarn…. [moves] beyond memoir to become a chronicle of a nation. There is black and white, yes, but much more in the shades and tones of their mix—and it is in exploring them that Rogers, too, find his art." 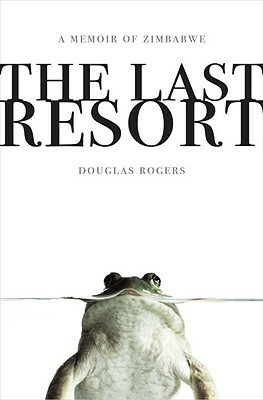 "Zimbabwe in vertiginous decline is the backdrop for Douglas Rogers’s corrosively funny THE LAST RESORT, in which Roger’s parents, among the country’s last remaining white farmers, attract everyone from prostitutes and diamond dealers to their backpacker lodge." —Vogue, featured in "The Season's Best Memoirs"
"Born in Zimbabwe, New York-based travel writer Rogers moves between two worlds with wit and grace while telling the dire-straits story of his childhood in Zimbabwe and his recent return....Angst, humor, beauty and terror mingle freely in his narrative....This rousing memoir should win over anyone with a taste for exotic can't-go-home-again stories. "As President Mugabe's regime turns belligerent toward white farmers, journalist Rogers witnesses the struggle of his family and others to hold on to their land....Rogers' decision to write about his parents' lodge and the people who find refuge there as violence erupts and the economy turns catastrophic brings him close to all kinds of people, black and white, from war veterans and politicians to farmers and squatters. Scrupulous in his documentation, Rogers talks to everybody about the way things were and what might come next....Brilliantly funny and wry." "Pitch-perfect, undeniably real, and, most important, achingly funny, Rogers deftly reminds us that after wiping away tears and even burying the dead, a good antidote to the violent, poignant, and completely absurd place that Zimbabwe has become is to throw arms wide to the undaunted African sky and simply laugh." "Travelogue, adventure yarn, political intrigue, tragedy, and high-wire journalism, The Last Resort is a love story about the author and his homeland, Zimbabwe. She is by turns ineffably beautiful, unspeakably hideous, insanely rich, desperately poor, democratic, brutally autocratic, violent, corrupt, and dysfunctional, even though, in person, her people seem to be, one and all, hardscrabble heroes and survivors. Rogers tries to leave her and doesn't even want to write about her, but, in the end, her charms are irresistible. He can't help himself and neither can we." "With breathtaking talent, wry wit, and abundant heart, Douglas Rogers tells the compulsively readable tale of his parents' daily struggles to hold on to their land in the nightmarish landscape of present-day Zimbabwe. With every turn of the page, you fear for the Rogerses' survival, as well as the survival of the country they love so much. But even as they face the most difficult of challenges, their indomitable spirit shines through, revealing the ordinary heroism of people in extraordinary circumstances."